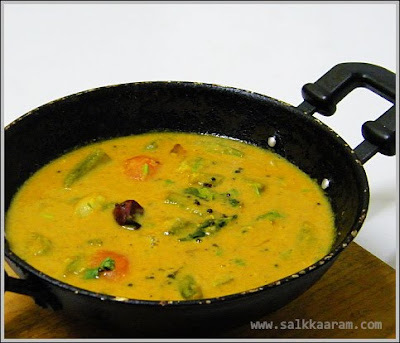 Okra Sambar / Vendakka Sambar | Simple and Delicious ! Am very lazy this week , so leaving an old vendakka sambar for you.. Not much change in the usual sambar recipe, but love preparing this one without using so many other vegetables..
Peel and chop potato into big pieces. Cook dal with turmeric powder,potato,onion, small onions and salt. Heat little coconut oil in a kadai and saute ladies finger for some time until it looses the stickiness. Heat 2 tsp coconut oil again, fry kayam in it. Then fry uzhunnu parippu until it gets golden color. Next add cumin seeds and fenugreek and when it starts spluttering add grated coconut. Fry until the coconut gets slight brown color, add the coriander and chilly powder. Stir for less than one minuter and remove from fire. Allow to cool, then blend it with water until you get a smooth solution. Add vendakka pieces and chopped tomato to the cooked dal-potato mixture. Pour the blended solution , tamarind extract and salt to the above. Boil it until tomato is cooked, remove from fire. Heat coconut oil again, allow mustard seeds to splutter, fry red chillies and then curry leaves, pour this to the above cooked sambar. Sprinkle chopped coriander leaves over it. only vendakka or with lots of other vegetables, i love sambar anyday!! Wow!! Okra sambhar looks soooo yummy, love the color! vendakka saambar is very famous in kerala. but ingredients are little differ from what my wife makes. my daughter tried out this and found very tasty. while browsing in your net, we found CHEMMEEN WITH kadachchakka. MY DAUGHTER RAKHI IS GOING TO TRY THIS TOMORROW MORNING. CHEMMEEN IS ALWAYS AVAILABLE AT SAKTAN MARKET, TRIHCUR. but the case of kadachakka is problem. not availale always. Hi Seena, this sambar looks delicious! 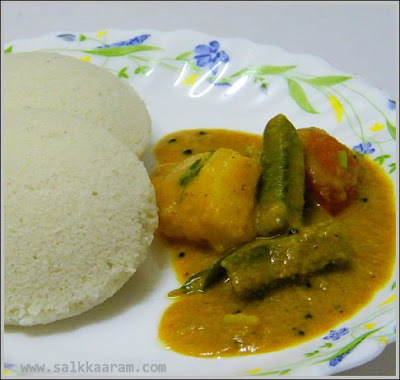 My hubby likes sambar a lot and vendakka is his favourite too , so may be I am gonna try this soon..
Hi Seena, this looks very delicious. It must've tatsed yummy. I love the flavor and tatse of sambar when u add okra. YYummy and nice recipe. Thanks for sharing. Hey! sambar is "fingerlicking" good! It has a very subtle flavour and yet has a very rich taste. I loved the taste and obviously he liked it very much & is going to have a great lunch! Thank you once again Seena... !Adipoli! You know once there's okra involved, I'll want some. YUMM!!! It looks very delicious.